Lucky Bones is fast becoming (though really it already is) a must visit Cape May establishment. With a large restaurant footprint (i.e. tons of room), family oriented menu, a large bar and live music, and plenty of on site parking, it makes for an easy way to spend dinner with the whole family. The large bar allows you to sit and watch the game or just converse with your friends, and the separate dinning area has big tables to accomodate large groups, and third room is kind of a combo dining area that features an occasional live band performance. It's in that room that you'll see their one of a kind brick oven pizza. All their breads, roasted garlic and peppers along with hand made pizzas are cranked through this oven and it makes for some delicious fare. 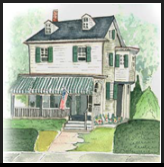 This interview originally appeared on my capemayX website, but since that site went on a sabbatical, we decided to bring it on over to the Longfellow Guest House website. After all, the video features the type of content that is exactly what our house is all about: fun things to do in Cape May with your family and friends. So check it out. You can get a sense for what Lucky Bones is all about and may be motivated to take the whole family. They can get busy in the Summer so definitely call ahead to get a sense for how packed it is and how to reserve a table. Posted on April 25, 2011 by Michael and filed under Longfellow Recommends.